Since my last post I’ve received yet another board from Emanuel – another prototype FPGA board with Spartan 6, SDRAM and SSRAM. 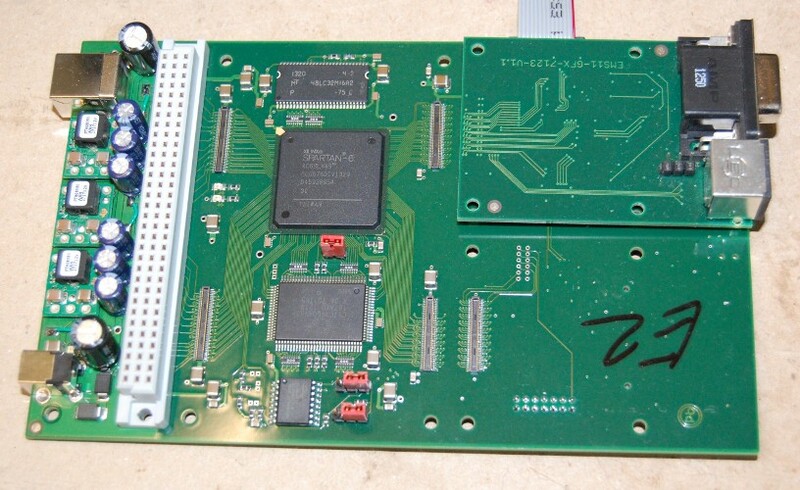 This one’s a little simpler than the previous board, with no ports other than USB on the board itself, and a daughter card with a VGA connector on it. Unlike the previous board, which had a 2-bits-per-gun resistor ladder DAC, this one has an ADV7123 video DAC chip – the same one used on the DE2 board – which has an impressive 10 bits per gun. That’s good enough to do 24-bit true colour with headroom for calibration tables! Having received the ESM-BB10 Spartan 6 board a couple of weeks ago I was naturally keen to see it in action. Since I only have the free “WebPack” version of Xilinx’s ISE design suite, I can’t use the ChipScope logic analyzer (roughly equivalent to SignalTap, I believe) – so debugging is going to be tricky. Therefore I’ve taken a methodical, step-by-step approach, testing the various parts of the board one by one. Apologies for the lack of recent updates. I haven’t been completely idle but my time’s being filled with other things at the moment, including replacing light fittings, hanging pictures and learning the guitar! Despite the silence, I’ve not been completely inactive on the FPGA front, however, and I’m still slowly building my library of demo projects for my “Flex” variant of the ZPU processor. In the process I’m redesigning and streamlining a lot of the components that made up the TG68MiniSOC project, so that will be updated with the results before too much longer, and I’ve also started branching out from being purely Altera-based into Xilinx too. 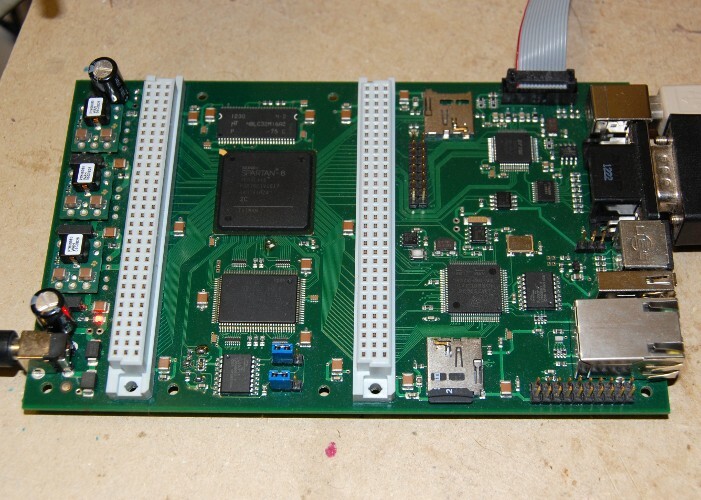 This last development is the result of reader Emanuel Stiebler very generously supplying me with a Spartan-6 board! This has an XC6SLX45 FPGA, 32 megabytes of SDRAM, 4 megabyte of SSRAM, a microcontroller, dual micro-SD slots (one for the µC, one for the FPGA) and an assortment of IO ports. I’ve already ported a few of the ZPU Demos to this new board (and a couple of the simpler ones to the original Minimig board while I’m at it!) but will post about the process in more detail soon.